There are many definitions for the word bowl. It is a noun and a verb. This week's Art Of The Day purposes, we are going to present art that illustrates the two definitions most commonly listed first in many dictionaries. Though perhaps not always in a conventional way. 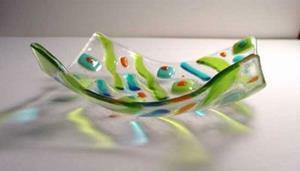 1. a rather deep, round dish or basin, used chiefly for holding liquids, food, etc. 2. the contents of a bowl: a bowl of tomato soup. This piece was all about having a ball with the medium. Brightly colored art glass was arranged in a free form design on a heavy clear base, then kiln fired to fuse the glass together. 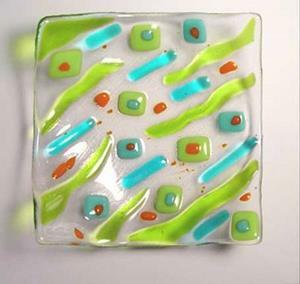 The resulting piece was then kiln fired again on props to form a funky free-form dish reminiscent of martini olives or confetti, (or both)! 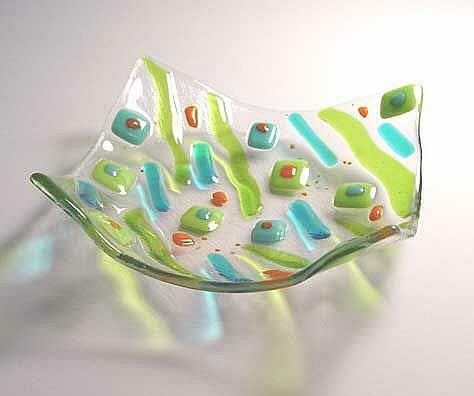 Very fun and colorful, with lovely cast shadows and a nice tactile weight.